The 4R Nutrient Stewardship Certification Program has announced that Diversified Agri-Services Inc. in McCutchenville, Ohio has been added to its growing list of nutrient service providers to achieve certified status. Diversified Agri-Services Inc. was started in 1978 by David and Linda Karcher. The facility was purchased by Blake and Nicki Rossel in 2012 and currently employs six full-time and two part-time employees. Working with farmer clients in Wyandot and Seneca counties, Diversified Agri-Services Inc. offers soil and tissue sampling, variable rate applications of gypsum, lime and fertilizer, and a full lineup of seed, crop protection and nutritional products. The 4R program certifies nutrient service providers in the Western Lake Erie Basin that apply fertilizer, or make application recommendations, are doing so in accordance with 4R Nutrient Stewardship principles – which refers to using the Right Source of Nutrients at the Right Rate and Right Time in the Right Place. Program participants must go through an annual, independent, third-party audit and demonstrate they not only understand 4R principles, but also follow them. Approximately 2.7 million acres and over 5,500 grower customers are serviced by the 34 facilities in Ohio, Michigan and Indiana that have earned 4R Nutrient Stewardship Certification, with approximately 70 percent of those acres located in the Western Lake Erie Basin. “By participating in the 4R Nutrient Stewardship Certification Program, Diversified Agri-Services Inc. has proven its ongoing commitment to the long-term improvement of Lake Erie’s water quality,” said Carrie-Vollmer Sanders, Nutrient Stewardship Council chairwoman. “Diversified Agri-Services Inc. has worked very hard to ensure its operation is following the 4Rs, and we congratulate them on earning their certification,” said Andrew Allman, executive director of the Nutrient Stewardship Council. The 4R Nutrient Stewardship Certification Program is governed and guided by the Nutrient Stewardship Council, a diverse set of stakeholders from business, government, university and nongovernmental sectors with a common goal of maintaining agricultural productivity while also improving the quality of Lake Erie and its contributing watersheds. The program is administered by the Ohio AgriBusiness Association. For more information, visit 4Rcertified.org, email aallman@oaba.net or call 6143267520. MEDIA: A high-resolution photo of Diversified Agri-Services Inc. receiving its 4R Nutrient Stewardship Certification sign is attached with this release, and can also be downloaded at www.4Rcertified.org/news. 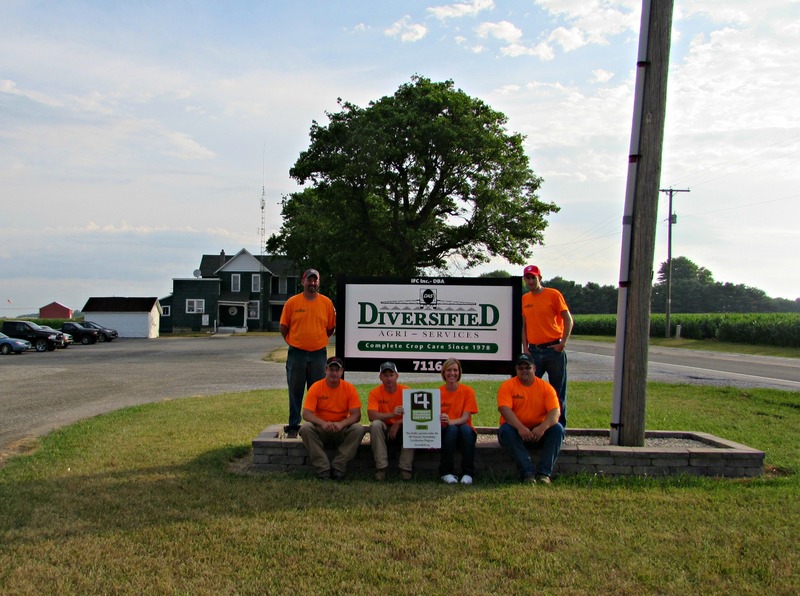 CUTLINE: Diversified Agri-Services Inc. in McCutchenville, Ohio is now 4R Nutrient Stewardship Certified. Employees pictured include (from L to R) Mike Castanien, Matt Gorby, Blake Rossel, Natasha Kingseed, Joel Zaenger and Jonathan Feck.